Over a year of thinking, prodded by the garden tour, has brought me to this great experiment: Great Plains native plant garden consulting. Feel free to link over to the main Monarch Gardens site and check me / us out (strange how, when starting a service or business, the singular becomes the plural--as if I have multiple personalities). Both joy and sadness necessitate attempting this venture. I've extensively researched and written horticulturally for two books (and experimented in my garden), so I feel I have something to give--but I think my garden can speak for itself. I want to do something good for the local ecosystems, and I believe helping create sustainable native plant gardens of any size is a good step. I was also not rehired for my university teaching position. I've been teaching for chump change since 2000, over 30 classes, and now it's time to take some leaps of faith (could also be a mid life crisis--I turn 35 in July). Higher education is in a shambles--and not just because I can't do what I love, namely work with students, be in that environment / time period of profound discovery and change. So, I'll try do something else I love--talk plants, help the environment. If I can't be wonderfully humbled by students, plants will do. If you're in Lincoln or nearby and want to test the waters, please do contact me and we'll take it from there. I have a photo and a caption in the current July / August issue of Orion. I love that on the page after me is a piece by Bill McKibben, and also in the issue work by Scott Russell Sanders. These guys have been major influences on my early environmental thinking. But to see my wife and sandhill cranes go to page 9. I also won a $100 gift certificate from Prairie Nursery, 1st place in their photo contest for an image of a pasque flower (it's in the Flickr rotation on the top right of the blog). 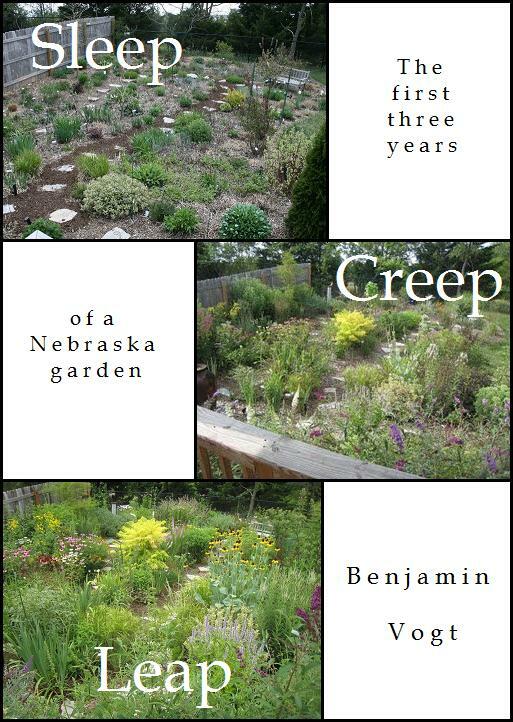 I have decided to self publish my second memoir this summer--Sleep, Creep, Leap: The First Three Years of a Nebraska Garden. I went through so much wasted time and torture trying to find agents and presses for the other unpublished memoir--Morning Glory: A Story of Family and Culture in the Garden--that I just want to short circuit what seems to be a broken system and have more time to work on my Oklahoma memoir, Turkey Red (one more trip to Kansas and Oklahoma in the works). I have a PhD and MFA, tons of publications and awards, and I hear plenty of good things about my writing--in fact, SCL came close at one press. So, might as well try this. I know that self publishing can be career suicide in my profession, a professor (an unemployed one), so I won't put it on my cv. My hope is to drum up enough sales to attract an agent or press, which seems to be the new paradigm in publishing. Of course, I could fall hard on my bum, too. But so what? I've been working on a cover image for Kindle, iPad, Nook, Sony Reader, Mac, and PC. Then I will work on the difficult specs for a print-on-demand paperback. I figure the ebook will be $3-4 and the paperback $7-10 (100 pages). Sound ok? How much would you pay for either? Here's a table of contents for Sleep, Creep, Leap. 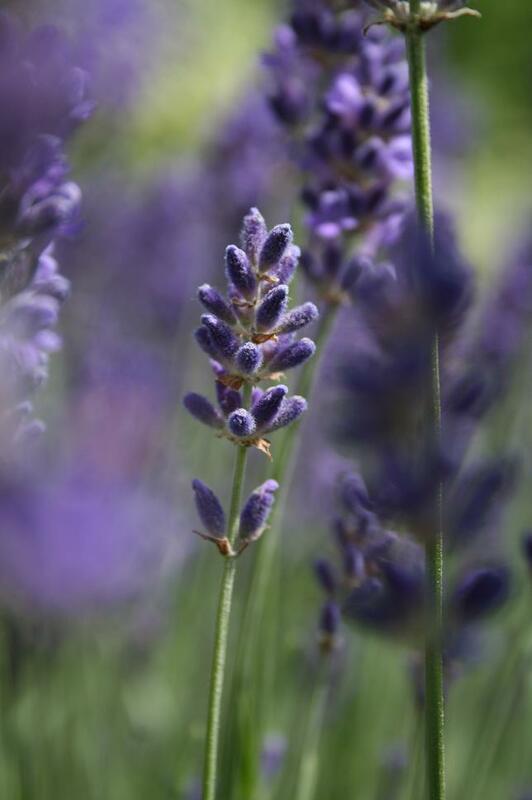 It's not fantastic, but here's my lavender in the breeze for Gardening Gone Wild's Picture This Photo Contest for this month. I suggest clicking on it to expand the image to make it more interesting. On Sunday I had 500 folks come through the garden in five hours. Even though I was sweating like a rain forest--man it was steamy--I so very much enjoyed talking with people, and even seeing strangers in my garden. If you know me, THIS IS NOT LIKE ME AT ALL. But I also like vegetables now. I wish I could remember who I talked with, what we talked about--so many interesting folks who were willing to learn about native plants, who asked tough questions, and who were genuinely interesting (and respectful as they navigated my tight paths). My god, look at all that grey hair on me!!! We got lots of folks to see the monarch cats on the deck. Luckily, my wife helped, and was able to talk with as many people as I did--even though I was talking with three people at once in nine directions. She said several asked if I did garden consulting or coaching, and one or two also asked me. I've been playing around with the idea for a year as a way to have summer income when I'm unemployed. But I woke up Monday energized by the idea. Any garden coaches out there? Any advice? 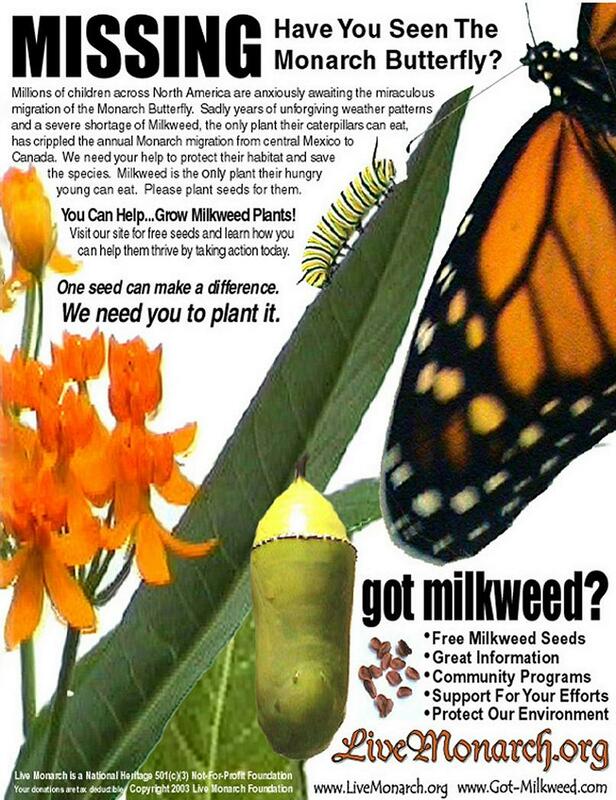 If you snoop around hard enough, you'll be able to find a website I already have regarding Monarch Gardens, my shadow native plant consulting / coaching business. If I could write in the mornings, coach in the afternoon, garden in the evening, that'd be a perfect way to spend one's life. For a while anyway. A trip to Provence would be nice. Maybe a book tour. Tomorrow is the big tour. Upwards of 1,000 folks in 5 hours. If your private jet or transporter aren't working and you can't make it to Nebraska, you're in luck. Sorta. The garden has a few lines from my poems on the fence, sculptures by local artist Shannon Hansen, monarch caterpillars, lists of my favorite native plants, books for sale, and two dozen plants I'm giving away. Let's go. ﻿If you'd like to see the 1,500 foot garden from its humble beginnings (20 yards of mulch) in 2007 to what it is now, link here. A better way to see the visual timeline and various wildlife is to visit the fan page on Facebook for The Deep Middle. And here's a link to some shaky video. It would not have been shaky if technology didn't move so fast. If you'd like to tour the garden in a more literary way, why not check out some chapters from my manuscript Sleep, Creep, Leap: The First Three Years of a Garden. Link here (First Garden), and here (On Mulching), or here (Visiting Nurseries). Now, I have to go pull some hair, I mean weeds. If you enjoyed the recent posts on my Oklahoma trip, you'll enjoy my piece that appears in the regional newspaper Prairie Fire. Won't you? Well, I think so. "Native Plants + One Suburban Lot = Wildlife Preserve." The essay (or article) lists my favorite plants as well as places / resources to research and buy natives. The paper gave the below image a full color page! When I began the 2,000-square-foot garden four years ago, I was much more concerned about finding plants that wouldn’t suffocate in the clay soil in winter and spring, or whose roots wouldn’t be exposed by cracking cement-like soil in summer. In truth, I didn’t know much of anything. That meant non-native plants, common things the local nurseries sold—plants whose origins were likely to be in Asia, where most typical garden plants originate...."
that birds enjoy perching upon. So, it was 100 a few days ago and now it's 60. I need to divide some iris and widen the paths for the upcoming garden tour. A post, with pics, coming up of what will be going on here. For most of my life, when people asked me where I was from, I said without a doubt that I was a Minnesotan. I'd lived in the state from ages 10 to 24, and came into my own in the woods, lakes, and depths of lush nature in that place. I've always believed that without Minnesota, I'd have lived a much more insular life--one devoid of the awareness of cultural, spiritual, and physical diversity in this world (not that I'm exactly still that aware). I am a Minnesotan. I worked hard to deny the first 10 years of my life in Oklahoma. Whenever my grandma in Oklahoma called on the phone--often just as our favorite family tv shows were beginning or in the middle of dinner--I groaned. When we had to visit the state Mom would, it seemed, hold her breath the entire time. My Dad grew up there, and I've always wondered how he felt about the denial of my real roots. I didn't learn about the state bird or state anything of Minnesota; I grew up coloring in pictures of scissortail flycatchers and singing "Oklahoma" from the musical of the same name in elementary music class. I never wanted to hear the stories of my German Mennonite progenitors. When my Grandma or any other old person kissed me on the cheek and proclaimed, sometimes in unintelligible Low German, some special story--even if about that fantastic zwiebach bread--I shirked in boredom. This is all partly being a kid, I know, but it has defined the depression, darkness, and emptiness I associate with Oklahoma. As I've turned to face my childhood, I crave the stories that are gone. And as I've heard only a few from the last of my grandma's siblings, three sisters, something has begun to shift. I will never live in Oklahoma again, but as an adult I crave the stories like.... well, the only thing I can equate it to is the time I had acid reflux, no one knew that's what it was, and I was on a diet of mashed potatos and lime gatorade. I hated that gatorade, it was nasty and fowl. Now? There are days nothing else will do and I drink an entire liter in one gulp. Such is Oklahoma now for me. Such may be the next book. just south of the homestead. After visiting the Wichita Mountains, my wife and I headed north to Corn--where my great great grandparents homesteaded in 1894--and a bit further to Weatherford, where I grew up. I still, even writing this now, find it hard to realize that much of who I am and how I perceive the world is defined by that early Oklahoma perspective: conservative, guarded, obstinate, determined, seasoned by the soil and sun. Yet there's something I can't put my finger on now, not yet. Something in the history of this state defines me like an afterimage, a ghost, a memory I never lived but is encoded in my genes. Sometimes my wife still catches traces of my once-heavy southern drawl, a "rut beer" instead of "root beer," or a "y'all" with too much twang. Oklahoma was lawless in the 1800s. Squatters (sooners) staked claim wherever they wanted, including in Indian reservations, then complained to the government that they received no protection from the Indians, or had any political say with the Indians. Bands of cowboys, for a decade, clashed with Indians and farmers as they drove cattle north to Kansas to be shipped east and west. Gangs ravaged settlements, law was enforced from a distance in Missouri or Arkansas. More and more Indian nations were being crammed into the territory as reservations divided and shrank. The Civil War destroyed any wealth Indians had accumulated in their new lands prior to the 1860s. I had no idea that, just over an hour west of Weatherford, was the site of a battle in which Custer slaughtered a Cheyenne village along the Washita River, just 20 minutes east of the Texas border. In 1868, a time when the military made political policy in the Plains (even if the federal government had made other policies), there seemed to be zero tolerance toward "Indian agression." This agression was one of tradition, in part--young Cheyenne men trying to prove themselves as warriors as they've always done, raiding others as a sign of prowess, raiding wagon trains and cabins on the frontier. Dog Soldiers, a warrior arm of the Cheyenne, faught back the white invasion like a gorilla force. Near Cheyenne, along the Washita, peace chief Black Kettle, as an advocate of treaties, had so lost the respect of these men and other Cheyenne that he was forced to camp his band further west, away from the main winter encampments. Under pressure to subdue the Indians at any cost, Sheridan, in Kansas, ordered Custer to march south into Oklahoma Territory and strike the Cheyenne when they were their weakest. In winter. On November 27, 1868, Custer attacked from four directions at dawn. In order to creap up to the village undetected, the soldiers dropped most of their clanging gear, any shiney objects that might reflect in the moonlight, and Custer killed his barking dog. Dozens of Cheyenne were murdered at sunrise. Women grabbed children, ran to the Washita River, and tried to dig foxholes in the sloped banks as they were fired upon. A contingent of about 20 U.S. soldiers to the east were the least fortunate, having been cut off and surrounded, then all killed. It was a premonition of the Little Bighorn years later, when Custer would use the same exact military strategy against the nothern Cheyenne, but to a much different outcome. As my wife and I walked the battlefield, overlooking the vista from nearly the same point where Custer directed and observed the fighting, I felt like I shouldn't be there. I asked a park ranger--the site is run by the National Park Service--how the Cheyenne felt about this all, specifically Cheyenne peace chief Lawrence Hart (also a mennonite pastor), who I knew lived in nearby Clinton and advocated for this site to congress. "They are all for it," the young ranger said. And I believed him. And I didn't. I made sure not to take too many photos, and certainly none of the many prayer cloths hung in trees. As we followed the mowed trail through a restored prairie on what was the main battlefield and is now the Black Kettle National Grassland, we passed a portion of the creek where Black Kettle and his wife were shot off their horse. A wirey white couple and young boy were picnicing / fishing near the shallow water. Black Kettle's band had, only four years before, also been massacred in Colorado at Sand Creek. That his village was the one attacked again was coincidence, for Custer happened upon it first. After the battle Custer ordered all 800 Cheyenne horses shot, robbing the Cheyenne of the ability to fend for themselves, and eventually forcing them to nearby forts and more subjugation. Custer also took about 30 women prisoners, and there's strong indication that he and his officers raped the women on the way back to Kansas, even as Custer's wife awaited his return. It is unfair to to say this is what Oklahoma is, that examples like this color the state. But it is hard to deny the images and echoes of Native America on license plates, billboards, strip malls, and sculptures like the one atop the state capitol. In one sense, these images are an act of the "guilty" trying to make up for atrocities--they are token acts of healing that, to me, seem to only fuel the fire of misunderstanding and cultural appropriation, to Indian-ize the Indian. What's left of the homestead, and some short winter wheat. My family homesteaded on virgin prairie, an allotment purchased after the Dawes Act dictated that Indians must choose their own allotments first (160 acres), as the reservations were being eliminated and those lands opened up to white settlers. My family fled the Netherlands in the 1500s amid stake burning and lynching for being heretics, then from Prussia (Poland) in the 1700s, then from Russia to escape military conscription. They were farmers whose Christian beliefs were, in retrospect, only subtly different than other Christians. They were also, in their way, an extension of an avid Mennonite boarding school program that shipped Indian children east. The barn, half gone in just two years. Perhaps for me Oklahoma is truly what some cultural historians have called it--an excellerated microcosm of western expansion, of all that is good and bad with American existence itself. In only a few decades an "empty" swath of land was not just colonized, but completely and totally reformed into an unecognizable physical landscape, to say nothing of the cultural upheaval that occured across its soil. The speed of this "reformation," almost blind and deaf in its train-like / tornado-like rolling across the prairie, is simply unimaginable. So, maybe, Oklahoma is my facing facts, is my looking long into the mirror. I have always felt uneasy there. It is still, in essence, wild, even amidst the pumpjacks, fences, windfarms, and fields of wheat and cotton. As the wind tears through the open windows and doors of grey farm houses, as it lifts soil from between crops, as it sculpts and contorts the few oaks and cottonwoods along shallow creek beds into half rainbows of bark, it is not hard to hear the echoes of those that have come before, of the people: Cheyenne (who called themselves "the people"), Arapaho, Kiowa, Wichita, Caddo, the bison, black bears, elk, and prairie dogs, the bluestem, switchgrass, coneflowers, and leadplant, my grandmother, great grandfather, great great grandparents--and finally myself, a boy with red dirt in the corner of his eye, unable to get it out, stinging until I ignore or accept it and absorb it into myself.